OTHER SIDE: Rural Economic Downturns Fuel Sagebrush Rebellion Events? | RANGEfire! OTHER SIDE: Rural Economic Downturns Fuel Sagebrush Rebellion Events? 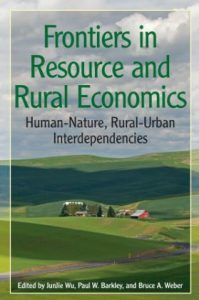 According to HCN, nature resource-dependent rural communities help explain why disputes happen where they do. NOTE: In the West, there is an old saying to the effect that: “good fences make good neighbors.” At RANGEfire! we acknowledge our virtual neighbors on this virtual landscape, especially including HCN — High Country News. We acknowledge that there are always at least two sides to every story. When what is being said is clearly on the “other side of the fence,” we will try to acknowledge that, to make it clear that we are simply passing along what others are saying about the issues and subject matter that we talking about, even when it does not reflect our views, and may in fact be the polar opposite — which is why it is from the other side of the fence. But we think it is important for people to have an opportunity to hear the other side of the story, and know what others are saying about these issues. According to HCN, “When armed anti-federal government militiamen occupied the Malheur National Wildlife Refuge, they added strain to Harney County, Oregon’s already-weighty list of woes, which include a shrunken economy and the decline of a once-abundant timber industry. On Monday night, county judge Steve Grasty told a crowd of exasperated residents the occupation was costing Harney County between $60,000 and $70,000 per day to step up security for the community and area schools — but doesn’t include the costs of Oregon State Police and federal law enforcement that have been ushered in. “We’re going to send Mr. Bundy the bill,” he said. For Harney County, a rural Southeast Oregon community that was once the wealthiest, but is now among poorest in the state, it would be a good payout. That Harney County is strapped for cash and in the midst of a Sagebrush Rebellion-type standoff is not unusual. While it’s difficult to identify causation between regional economic shifts and the actions of individuals like Ammon Bundy, who is leading the current occupation in Oregon, counties where Sagebrush Rebellion events happen are more often than not places that have had dramatic economic downturns. They are places where extractive industries have fallen from their previous importance. Natural resource or extractive industries like logging and mining are still alive in Western states, but are less central to rural economies than they were several decades ago because of factors including mill automation, decreasing demand for timber, and federal regulations protecting old growth. And that shift is widening the economic — and in turn, cultural —gap between the region’s metropolitan and rural areas, says Ray Rasker, executive director of Headwaters Economics, a nonprofit research organization. While 97 percent of the population in the West live either in a metro area or with easy access to one, only 3 percent live in rural areas. “We’re talking about a very small percentage of the population that’s left out and disenfranchised — and it’s a very vocal population,” Rasker says. Though many counties have successfully bounced back from one extractive industry to tourism, recreation, or to another extractive industry, for the counties that haven’t, the effects can feel devastating. Harney County and its nearly 7,500-residents once had a thriving economy driven largely by the timber industry. The income generated from extractive industries, like logging and mining, peaked at $109 million in the mid-1970s. Since then, timber industry income has dropped 35 percent in Harney County, according to Headwaters Economics. And in 1983, two major timber mills shut down. Those closures signified the start of a downward spiral for the logging industry. Between 1998 and 2013, timber and logging employment shrank nearly 70 percent in Harney County; today fewer than 200 jobs — or 4 percent — are associated with logging and forestry. Now, the natural resource extractive economy in Harney only accounts for $38 million income annually — or a drop of 35 percent — and is far outpaced by the non-labor income. Federal payments like social security, disability, welfare, Medicaid, food stamps, along with investment-related income, bring $126 million into Harney’s economy. The Malheur occupiers’ argument plays off those frustrations. “It is our goal to get the logger back to logging, to get the rancher back to ranching, to get the miner back to mining, the farmer back to farming,” says Ammon Bundy. “We’re going to be reversing this in just a few years by freeing up these lands and resources by getting them back to where they belong.” But while many locals are critical of federal overreach, they are also fatigued by the armed antics of occupiers like Bundy that have staked claim on the Malheur Wildlife Refuge since January 2. In Lincoln, like Harney, a diminishing timber industry has lead to reliance on federal aid — and discontent from the more conservative residents. Natural resource industries were once the economic driver in Lincoln County. Sectors including logging and other extractive sectors like mining peaked in the early 1970s and once provided $240 million income to the county’s economy. Now mining contributes only 128 jobs, or less than 2 percent of the economy. Ranchers v. feds in Catron County: In Catron County, New Mexico, disagreements over federal grazing fees in the 1990s led to long-festering political discontent. When its economy began to turn at that time, loggers and ranchers lobbied to return to an existence with fewer regulations. For example, Kit and Sherry Laney, Catron County ranchers, launched a legal battle with the U.S. Forest Service in 1994 after the agency threatened to slash the Laneys’ permitted cattle numbers from 1,188 to 600-800 per year. “This business is ingrained, it’s a part of you, and somebody comes and takes that away from you. They might as well take your life,” Laney said at the time. In 1997, a court ruled the Laneys’ cattle were trespassing on Forest Service lands and in 2014, the Laneys’ ranch, the Diamond Bell, was shut down by law enforcement from the Forest Service. The decades-long dispute was mirrored by a grim economic climate. Catron County’s natural resource-based economy has declined nearly 45 percent since 1980 and service industries like retail, finance, public utilities, and transportation have also dropped by nearly 20 percent. In Catron, the only growing sector is government jobs and non-labor payments like Medicare, social security and welfare, reflecting a trend of increasing reliance on federal aid in rural areas across the West. Clinton monument feeds tensions: In 1996 in Garfield County, Utah, President Clinton announced the Grand Staircase-Escalante National Monument — the first national designation overseen by the BLM. The designation was a big win for environmentalists, but the monument prevented coal-mining leases from being developed there and put in place strengthened enforcement of grazing restrictions on ranchers*, which angered the resource-extraction community. At its worst, the dispute amounted to ranchers releasing cattle onto federal lands, leading to fines and lawsuits. Since then, squabbles between conservative Utah lawmakers and Congress over the management of federal lands within the state remain unresolved. As in the other counties where Sagebrush-style flare-ups have occurred, the natural resource economy in Garfield County has declined more than 40 percent since the 1970s. In the last decade, employment related to agricultural services, forestry, and fishing declined more than 500 percent. Government and construction sectors have increased their staff by nearly 30 percent and 80 percent respectively. In many rural Western counties, of course, ranchers have worked collaboratively with federal rangers to find progressive techniques that satisfy both parties. And other counties that have suffered crushing blows to their extractive industries have found still other ways forward. Take Aspen, Colorado, a town long ago associated with coal mining that transitioned to a tourism and services-based economy. Others have managed to do that in less glitzy ways, like Rosebud, Montana, which quickly recovered from a fading timber industry when it turned to coal power development. Rasker of Headwaters Economics says there’s also strong potential for green energy development.